Love the cooling effect on one side. No neck pain when I wake up! 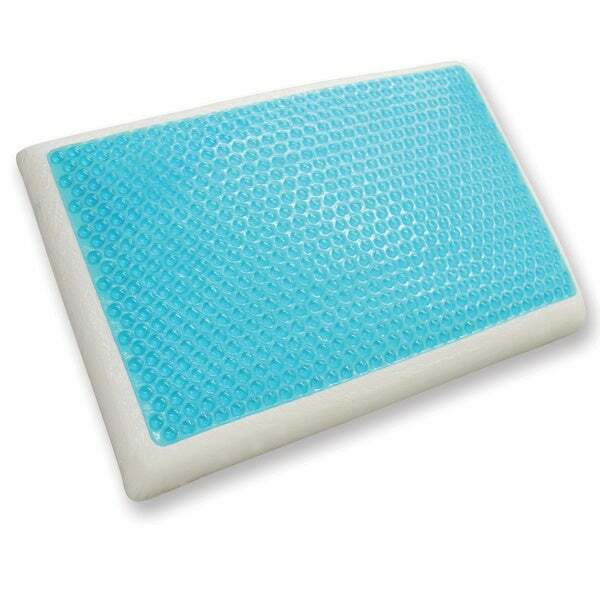 Get the restful sleep you need with this reversible cool gel memory foam pillow from PostureLoft. This five-inch pillow is naturally antimicrobial and resistant to dust mites, making it the perfect hypoallergenic pillow for your bed. On the memory foam side, this pillow is medium-soft, while on the cool gel side, it is medium-firm, making it ideal for all types of sleepers. I LOVE this pillow~!! I love the cool side, great for headaches. Still, I prefer the flip side as it is less firm. I don't care for a very firm pillow, but, due to breathing difficulties, this is ideal. I have been sleeping through the night, every night, since I received it last week~!!!! YAY~!!!! I was very pleased with this pillow as was my husband. The pillows are very comfortable and supportive of your neck. Also, the cool gel which keeps your head from getting hot is great in summer & winter because it's cold it is just cool enough that your head doesn't get sweaty no matter the time of year. This pillow is very comfortable and supportive. And when your head first touches it, the gel part is very cool. It does get quite warm through the night. I received the pillow, let it stand, so,it could expand all around, for the required 48-72 hours. The first time I put my head on the pillow, I knew there was a problem, the gel WAS NOT COOL TO MY HEAD and my head was lower than my shoulder. There were absolutely no firm areas in this pillow as stated. I put the pillow aside and reached for my old gel pillow, that I purchased from Overstock and is AWESOME just old. The next morning, I measured the depth of the new pillow, it was only 3" - 3 1/2" deep, not the 6" deep as stated in the description. Overstock was, as always really great in taking care of the return of this pillow for me. Once again, thank you, Overstock, for,standing behind your products!! I enjoyed them the first night I used them. Really do keep your head and neck cooler. I ordered this pillow due to hot flashes sometimes. It doesn't stay cool, I have to move over and turn the pillow over. The only reason for 3 stars is because the first 10 minutes I feel the cooling effect. too hard and wasn't good at all. I bought this pillow for my honey. He has a chronic issue, he snores and sleeps minimal. The pillow has lessened his snoring, and he sleeps longer now.....great buy for us both. Because I have one like it and it is very relaxing and comfortable.